I haven't had time to blog much lately. I won't give you excuses- you know how busy life can get, especially at the beginning of the school year. I did want to take a minute to post one my supply care bulletin board. Inside my primary school classroom, I have 4 square bulletin boards around the room. I rarely change these during the year as I use them to display important things that need to be visible to the students. 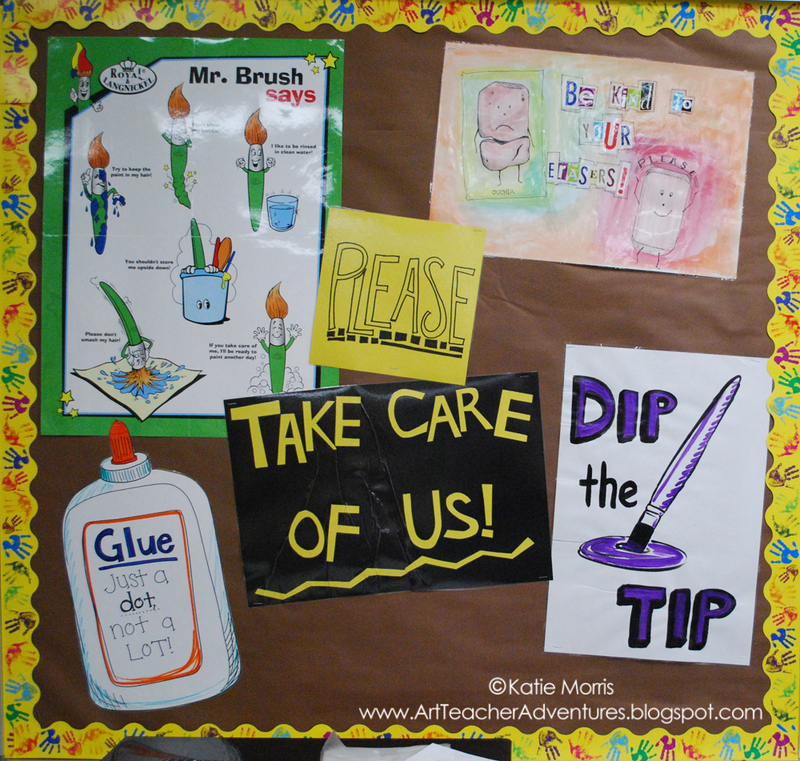 On my supply care bulletin board, I have a Mr.Brush poster that I picked up at a KAEA conference and three signs I've made. 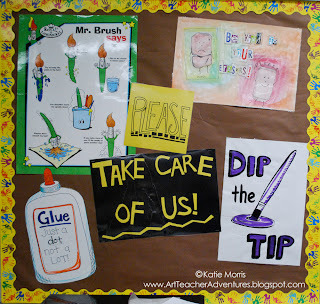 At the top right, we have "Be Kind to Your Erasers" inspired by the Fugleflick, the bottom right has my "Dip the Tip" poster, and at the bottom left, we have the glue bottle that says "Just a dot, not a lot!" I started saying "Dip the Tip" when we use tempera paint because I noticed students trying to scoop up as much paint as they could at once. Now they are catching on and repeating the saying. I find that short little rhymes and sayings really catch on and help the students remember what to do. A saying that my student teacher coined, and I'm totally going to continue using when she's done, is "Pencils Down, Thumbs Up!" I like to have students give me a "thumbs up" when they finish a step (writing their name, etc.) and are ready for more directions. Some of them like to keep playing with their pencils so Miss Bennett added the "pencils down" part at the beginning. I've been looking for that Mr. Brush poster everywhere! I can't seem to find it. A co-worker got hers from the AENJ conference last year, and said she'd try and pick me up one this year. It seems childish for a high school classroom, but she said it works! I always talk about Mr. brush! I didn't know he had a real poster!! Now even if I don't mention Mr.Brush every time we paint, the students do. Me: "Do you have any questions?" Student: "Don't smash Mr.Brush's hair."